Whether by its facilities, his style or his speed, the V48 sets new standards. The cockpit is fully equipped for outdoor activities. The cockpit covers can be set up for a complete or well deployed in bimini position closing or still folded on the arch for a maximum aperture... A garage located under sunbathing in the back allows to reach an annex or a jet - ski. The square includes an all-electric kitchen. The main cabin has a double bed while the rear two-bed cabin occupies the entire width of a ship. They each have their bathroom with a separate shower cabin. The living room couch is convertible into double bed for passing guests. With its potential for long crossings, high speeds and exceptional sea handling, the V48 offers a style for a navigation solution any time. Whether through its fittings, style or speed, the V48 set new standards. The cockpit is fully equipped for outdoor activities. Cockpit awnings can be fitted for full closure, or deployed in bimini position, or folded over the arch for maximum opening. Alternatively, year optional power sunroof is available. A garage located under the sun in the back allows to reach year annex now has jet ski. The square includes year all-electric kitchen. 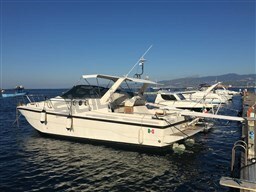 The main cabin has a double bed and the twin aft cabin occupies the full size of a boat. They have their own bathroom with separate shower cubicle. The sofa in the living room is convertible into a double bed for guests passing through. With its potential for long crossings, high speeds and exceptional seaworthiness, the V48 offers a stylish solution for all-weather navigation.